White Sheer Ribbon with Red Glitter Swirls has a pretty glitter wired edge for easy bow making. Jumbo 50 yards rolls! This classic ribbon makes beautiful bows for Christmas, Valentine's Day or weddings! Large jumbo rolls of 2-1/2" x 50 yards. 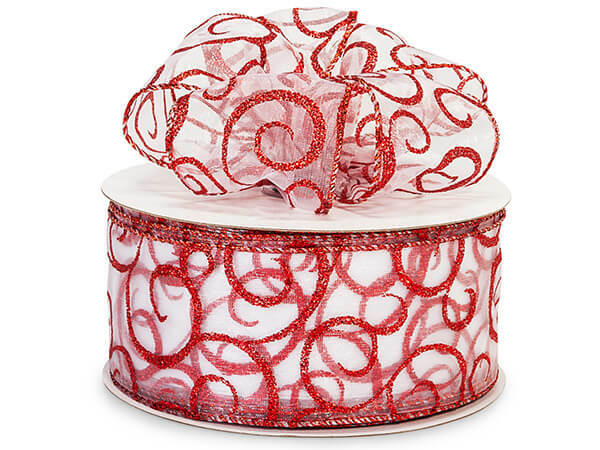 These woven organza ribbons have glitter swirls and are available in popular colors. Ribbons are very sheer yet hold their shape due to their heavy wired glitter edge. Made of 100% Nylon.